This year has been an exciting one for my son Peter, catching his first trout, largemouth bass, and striped bass on a fly rod. He was so nervous catching the trout early in year, but listened closely to my instructions, and was able to land it without help. When he hooked the largemouth, I could see the confidence building as he was able to get the fish to the reel and let the drag do the work on a few little runs. By the time I brought him out two weeks ago for his first striped bass, he looked like a seasoned veteran, refusing help when the fish was fighting hard. After a short battle he had subdued his catch, and was beaming with pride for the picture. It was such an exciting time for me to see him fishing on his own and succeeding. 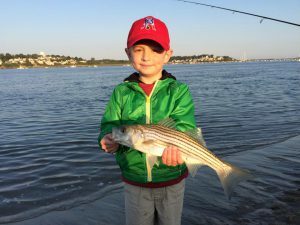 Experiencing these milestones has given me a greater appreciation of the role I have in creating special moments for my anglers while guiding, especially when they are a parent-child pair. Pictures play a very important role in preserving the memory, but they certainly don’t make it. I spend time talking to my clients before and during our trip to ensure that I am doing everything I can to make it the best fishing trip they could have by having multiple plans in place. Most of the time the parent just wants their child to catch fish, but I have found from talking with the younger anglers that they also want to see their Mother or Father enjoying catching fish. I’ve been fortunate enough to be there to assist in many anglers first trout or striped bass on the fly rod, and enjoy each time nearly as much as they do. There is a level of excitement that is contagious when someone finally accomplishes their goal and can check that first fish of a species off of their ‘to-catch’ list. That first one is almost never the last; rather it serves as a foundation to be built upon as they continue to fish and develop their skills. It’s cultivating that growing desire to fish in an angler that is truly my reward for the work of guiding. Thanks for reading. Tight-lines and stay safe out there. He’s a lucky guy to have a Dad who shares his passion and knowledge with him. Kids aren’t easy and you’re a patient teacher!